Monday, Technidyne employees took a field trip in the middle of the day to the local movie theater to see Star Wars: The Force Awakens. 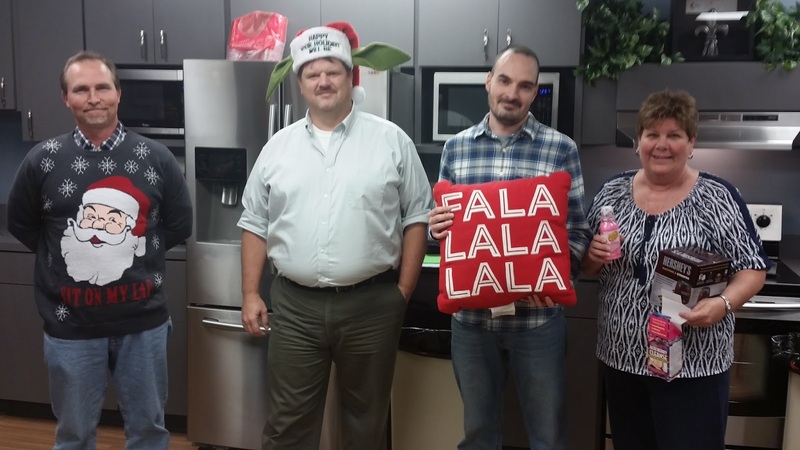 There is nothing like an unexpected break to get people energized for the end of the year push. A couple of weeks ago one of our employees was stricken with a medical emergency which forced him into the Emergency Room and a few nights in the Hospital. Sometimes it is the little things that we do on a regular basis that can keep us from having these emergencies. It reminded me of how regular Preventative Maintenance can prevent major problems. It also reminded me of how the Preventative Maintenance program started at Technidyne. In the early 1980's, two of Technidyne's service technicians had previous experience in the medical device industry. They realized that paper companies relied as heavily on their equipment as hospitals and emergency rooms. Neither was willing to accept equipment that had not been maintained and calibrated on a regular basis. 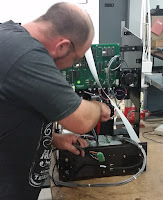 The Technidyne Preventative Maintenance program was born in 1985 to give paper companies the same confidence in the test equipment as the medical equipment patients and doctors rely on in hospitals. Our employee is back on the track to recovery. However, your equipment should never have to endure this fate if a solid Preventative Maintenance program is in place for your critical instrumentation. Tissue softness and optical properties such as brightness and color share similar characteristics. Many years ago, most considered the best tool for evaluating optical properties to be the human eye. Modern tools like the spectrophotometer today help us quantify what the human eye perceives. For tissue, the human hand has long been considered the best tool for determining tissue softness. The difficult reality is that any subjective evaluation creates uncertainty and uncertainty leads to variation. Variation is the enemy of consistency and quality. Simply put, the Emtec Tissue Softness Analyzer (TSA) is a tool that quantifies the otherwise subjective hand feel or “softness” evaluation of tissue. Why is the TSA beneficial? 1. The TSA is fast and easy to use. Anyone can learn to use the TSA to determine a measurement value indicative of tissue softness. That measure is the tissue softness index. 2. With quantified measurements, process parameters such as crepe or furnish can be optimized to improve softness. 3. With a measurement tool, benchmarking becomes easier. The graph (below) illustrates benchmark results for several different retail brands of bath tissue. 4. 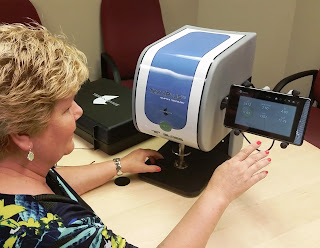 With the TSA, customer feedback or feedback from “Hand Feel” panels can be quantified, and from that feedback, product specifications are improved. With meaningful product specifications, I have historically seen more stable production. Stability and consistency are hallmarks of higher quality. If you want to improve the quality of your tissue products, try the Emtec TSA or consider sending in samples of your current tissue. 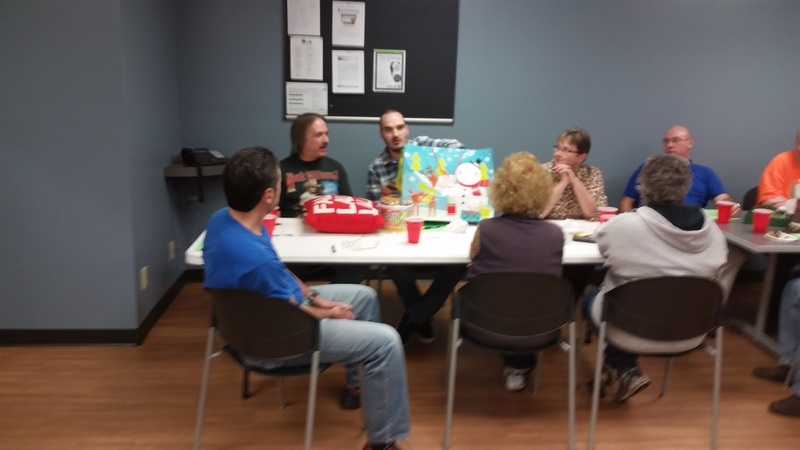 December 8, 2015, Technidyne had its annual Christmas lunch. All employees were treated to a buffet lunch. After lunch Todd Popson, CEO, recognized employees celebrating significant anniversaries as employees at Technidyne. 25 years - Paul P.
30 years - Paul C.
We are very proud of the fact that our average tenure is 17 years for all employees. We have added three new employees during the course of 2015. The CMC Color Difference Formula (below) is very good at defining tolerances that are directly related to how people see color and accept matches. The tolerances that are created are ellipsoid (left). Therefore, all samples which fall inside the ellipsoid are deemed acceptable and all samples which fall outside the ellipsoid are rejected. The moisture content of a sheet of paper is dependent on the relative humidity (RH) of its surrounding atmosphere because paper is hygroscopic (increase in RH causes and an increase in moisture content & decrease in RH causes a decrease in moisture content). Besides swelling, the uptake of water molecules produces an increase in fiber flexibility, which is important for many mechanical properties of paper. Moisture pickup due to water vapor in the air has a weakening effect on fiber-to-fiber bonds and influences mechanical properties in this way. 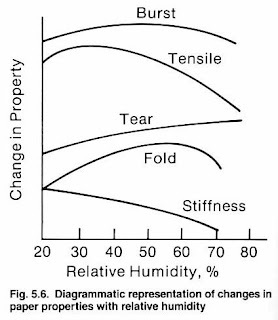 Tensile strength increases slightly to a maximum at 30-35% RH and then decreases quite rapidly at higher relative humidity. This decrease has been attributed to a weakening of fiber-to-fiber bonding. Tearing resistance increases over the entire range of RH, however, at some point above 80% the curve will fall off rapidly due to the disruption of interfiber bonding. Stiffness continuously decreases with increasing moisture content primarily as a result of increased fiber flexibility. Bursting strength is thought to be primarily a function of tensile strength and stretch. 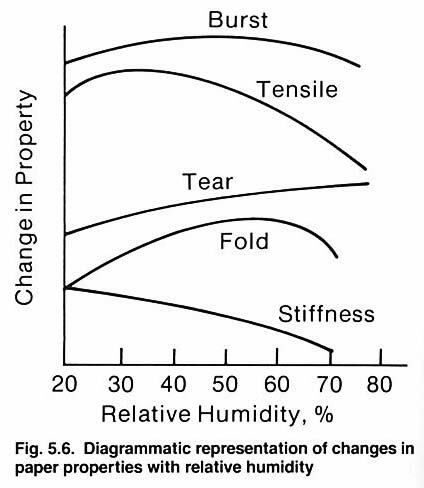 From 20-35% RH, both tensile and stretch increase, producing an increasing burst; from 35-55% stretch continues to increase and tensile falls off at an increasing rate, but stretch continues to rise although at a decreasing rate. Finally, above 55% RH, the decrease in tensile strength is greater than the increase in stretch, and bursting strength decreases continuously. Folding endurance is strongly influenced by moisture content, increasing noticeably up to 65-75% RH and then falling off beyond that. Folding endurance is a complex function of various factors and this response is not easily analyzed. Considering the variation in these properties due to variations in moisture, it is important to understand what conditions measurements are made under. If a sample is quickly moved from the machine to the lab for testing, the additional moisture from the machine can have a significant effect on the results. 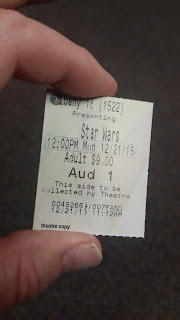 Conversely, paper will be most brittle when moisture-free. Using standard laboratory conditions and conditioning procedures will result in more consistent data that can be compared and used to make reasonable adjustments to achieve the desired results. Reference: Scott, William & Stanley Tosset, "Properties of Paper: An Introduction", p. 91-93, 1989. Source (or UV Level): A physical emitter of light. In any discussion of the measurement of the optical properties of paper, it is important to understand the difference between a light source (or UV Level) and an illuminant. The term light source refers to the actual light energy when striking the specimen during measurement or observation. For example, when paper is being viewed by a human being, the source of light striking the paper is generally either fluorescent light, incandescent light, daylight filtered through office windows or some combination of these. On the other hand, the light striking the sample in a measuring instrument is generally provided by either a quartz tungsten halogen (QTH) lamp or xenon lamp, either of which may be filtered to alter their spectral energy distribution. 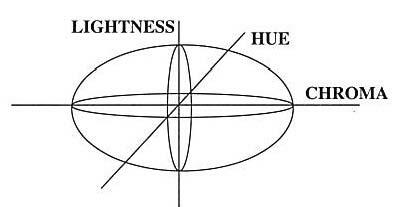 These are physical sources of light and are therefore referred to as sources not illuminants. An illuminant is a light defined by a spectral power distribution, which may or may not be physically realizable. For example, illuminant D65 was arrived at by taking a large number of measurements of daylight throughout the world at various times of the year. The data was averaged to arrive at the D65 spectral distribution curve. 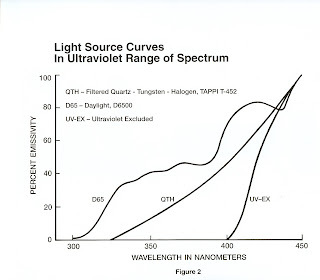 There is no known lamp and filter combination that will produce an exact duplication of the D65 spectral curve, therefore, D65 is an illuminant (a table of spectral data describing the spectral distribution of light energy) but it is not a light source (a physical object that produces light). In most colorimeters, the source and the reflected light are filtered to Illuminant C. This is true of the Technidyne Brightimeter and Technibrite instruments where the light source is filtered quartz tungsten halogen (very similar in spectral distribution to Illuminant A), however, the standard observer to which all of the filter functions are adjusted is based on Illuminant C. Most spectrophotometers offer either source C or 65. This is done by using a xenon lamp which has lots of UV energy and then a cutoff filter is used during calibration to set the UV Level to C or D65, respectively. The Technidyne Color Touch provides the user with a choice of three different sources, which differ by the amount of ultraviolet energy contained in each, D65 (high ultraviolet), C (moderate ultraviolet) and UV-EX (no ultraviolet). When this flexibility is available, and especially when dealing with the measurement of optically brightened papers, both the source (UV Level) and the illuminant must be individually specified. Thanksgiving isn't until next week in the US, however, we celebrated yesterday at Technidyne. 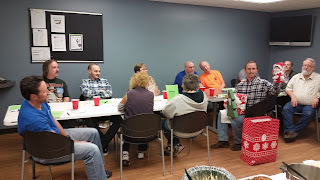 It was a fun time filled with great food, camaraderie, games and laughter. 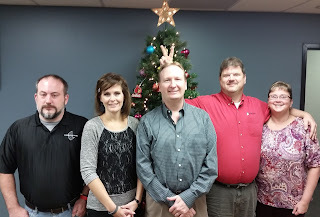 Thanks to the Technidyne staff for making everyone enjoy working together. 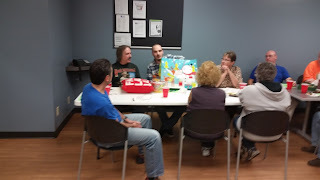 Here are some photos of the fun. Color Measurement: What is UV Level (or source)? When making color measurements it is important to understand the terms Illuminant, Observer and UV-Level (or source). There will be three separate blogs addressing each of these points. When making measurements on a spectrophotometer, many times different UV Levels or sources may be selected. The UV Level determines the amount of UV that will physically strike the sample when the measurement is made. This is generally calibrated to one of three levels, D65, C or UV-EX. In most cases a pulsed xenon lamp us used and there is a cutoff filter which is adjusted in the calibration procedure to mimic the amount of UV from the appropriate source. As seen in the chart (right), D65 has a lot of UV energy, similar to outdoor daylight. C has a moderate amount of UV energy, similar to office lighting e.g. some energy from fixed lights in the office and additional UV energy from light coming in through the windows. Note: UV Level C is nearly identical to what is referred to as QTH. UV-EX is UV-excluded, therefore, there is no UV energy when using this UV Level. Ideally, the UV Level should be selected which matches the Illuminant that is being used, e.g. D65 Illuminant & D65 UV Level. However, some people choose different combinations. The UV Level is important when measuring things with fluorescence. The UV energy will excite the fluorescing agent and provide a boost in the visible spectrum. Since a change in UV Level is a physical change in the amount of UV energy striking the sample, multiple measurement must be made to get the results of a single specimen under different UV Level conditions. This cannot simply be calculated. It is important to understand, though, that color values obtained under one UV Level will be different than those obtained under a different UV Level, The one exception is where the sample is totally non-fluorescent. In that case measurements under D65, C and UV-EX will all yield the same results. In the Paper Industry, UV Level D65 and C are very common. Typically, D65 is used to make process changes on the machine as it expands the measurement scale and allows for more fine tuning of chemicals. However, C is more commonly used in final specification setting since it relates to more common UV conditions that someone may encounter. Finally, there are still instances where specifications are based on D65 and UV-EX, primarily for specialty products. We have been working on some new videos to add to our Technidyne YouTube Channel. One of the latest videos is the TEST/Plus product line can be seen HERE. 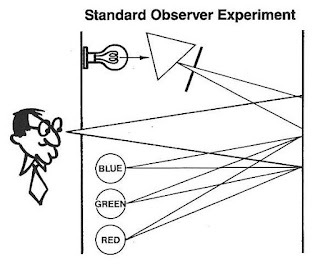 Color Measurement: What is Observer? The color data obtained from spectrophotometric measurements has no relationship to human visual assessments of color. 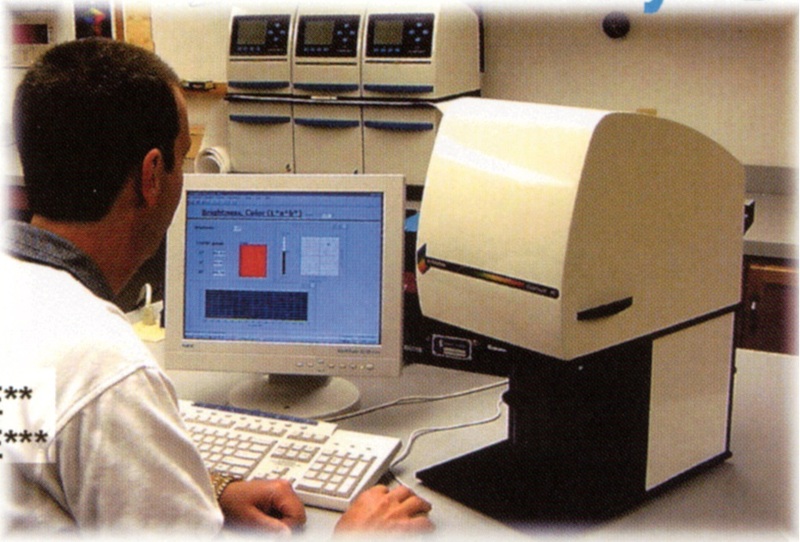 The spectrophotometer measures the reflectance of different wavelengths of light which is a physical phenomena. It is of no value to measure color unless the measurements relate to what we see. In order to make use of spectrophotometric data in the setting of product specifications, acceptance tolerances, etc., it is necessary to first convert the spectrophotometric data to a color scale which relates to visually observed color. In 1931, the CIE (Commission Internationale de l'Eclairage) established the "Standard Observer" utilizing and experiment depicted in Figure A. Monochromatic light of individual wavelengths is produced by the prism system shown and is projected onto a white screen. Three controllable colored light sources, red, green and blue are also projected onto the white screen superimposed upon each other. To begin the experiment, a single wavelength of 400 nanometers is projected onto the screen. The observer then adjusts the three colored light sources until the resultant color matches the individual 400-nanometer wavelength. 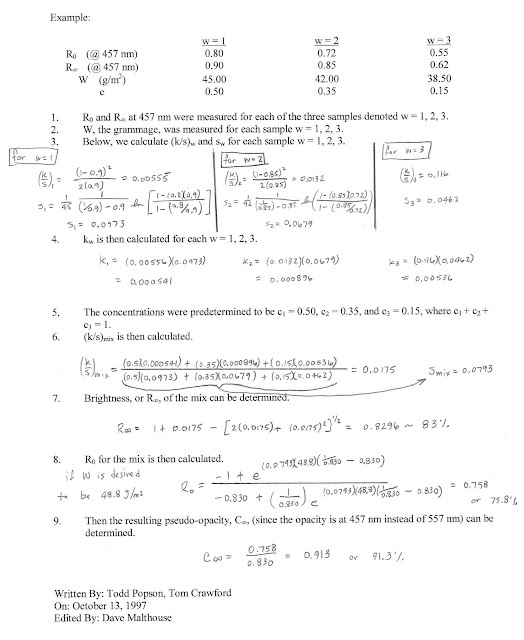 The observer then records the relative output of the three colored light sources. To continue, a single wavelength light source of 410 nanometers is then projected onto the screen and the observer produces a matching color by again adjusting the three colored light sources. This procedure was repeated over and over until individual wavelengths throughout the visible spectrum of 400 to 700 nanometers were reproduced by the three primary light sources, red, green and blue. After this experiment was performed by many observers, average observer responses were plotted and are shown in Figure B. Thus, the CIE Tristimulus functions X (red), Y (green) and Z (blue) were developed. These results obtained in 1931 were based on a cone angle of 2º viewing. Color measuring instruments which faithfully reproduce the standard average human eye response normally produce excellent agreement with human color assessments. Figure 3.2 shows the response curves of Technidyne colorimeter (dashed curves) superimposed on the average human eye response (solid curves). Effective wavelengths for the CIE functions based on illuminant C, 2º observer are: X (595nm), Y (557nm), and Z (455nm). In 1964, CIE developed a new set of tristimulus functions for a 10º observer to correlate with the viewing of larger samples. The relationship between the 2º and 10º standard observers is illustrated in Figure B. 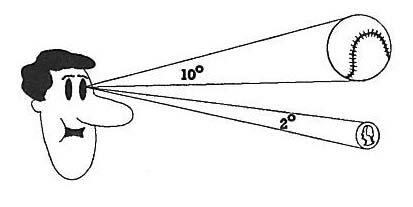 At approximately arms length the 2º observer would view an area the size of a U.S. quarter and the 10º observer would view an area the size of a softball. 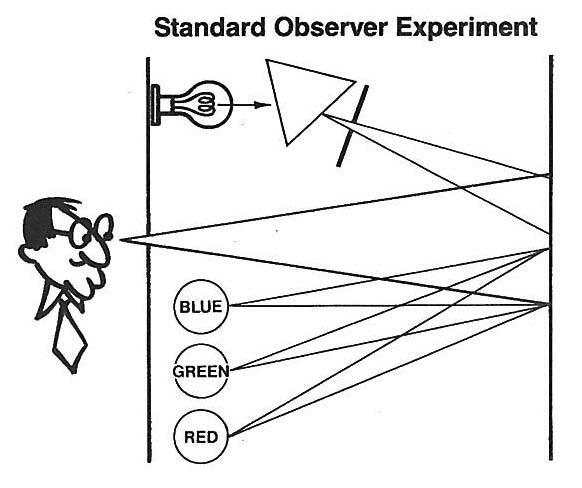 Remember that the so-called “Standard Observer” is actually an Average Observer. Every person has a different spectral response from every other person and that response is continually changing. The CIE standard observer has quantified a single, average, spectral response, which can be built into every color-measuring instrument. The instruments will, therefore, all agree with each other but an instrument will only agree with a human observer if the human has average spectral response. Since a change in observer is just a calculation in a spectrophotometer, after the sample is measured, color values for different observers can be determined with just a click of a button. It is important to understand, though, that color values obtained under one observer will be different than those obtained under a different observer, This is because the size of the area being viewed does have an effect on how people see color. In general, if illuminant C is used the observer is normally 2º. Likewise, if standard illuminant D65 is used the observer is normally 10º. Technidyne recently released the Color Touch™ X. Instruments have already shipped all over the world in just the first few months. Today was a celebration to recognize the time and effort put in to getting the Color Touch™ X to the market. Many hours of planning, development, software, hardware, prototyping, testing, debug, training, documentation and transitioning have led to this point. Many thanks to the customers, agents and employees that have helped launch the Color Touch™ X. It has many revolutionary developments and keeps Technidyne as the leader in optical testing equipment for the Pulp and Paper Industry. Color Measurement: What is Illuminant? 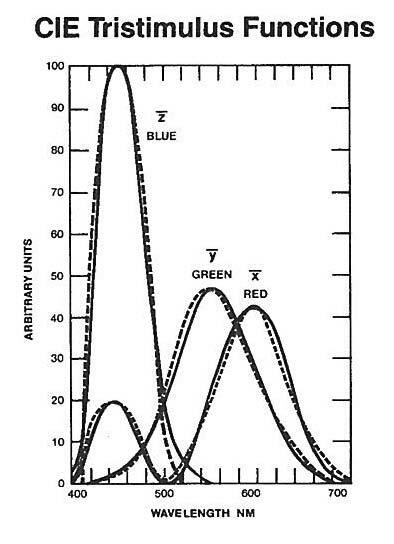 An illuminant is a light defined by a spectral power distribution, which may or may not be physically realizable. We may use a certain light to shine on the actual sample when we make a measurement. 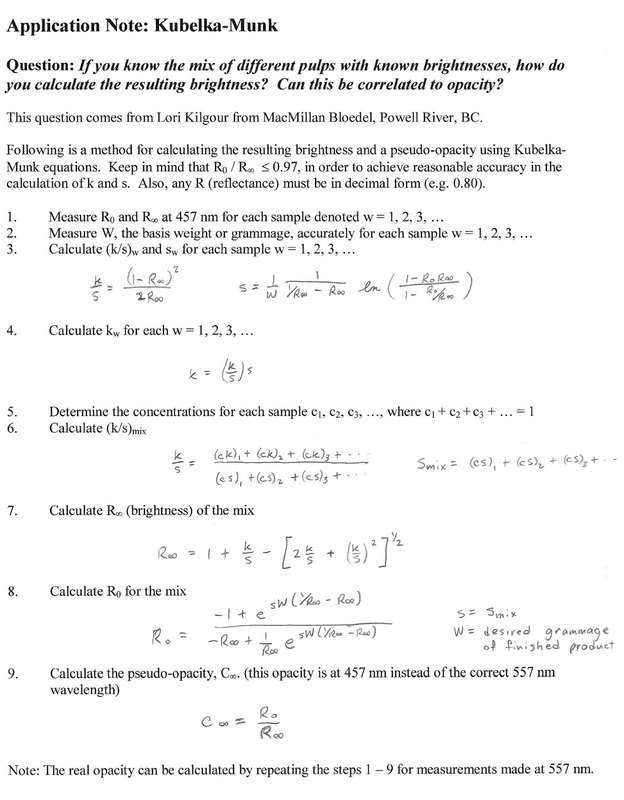 The illuminant is applied as a calculation to tell us how the sample would have looked if it were under that standard lighting condition (or illuminant). For example, most spectrophotometers use a pulsed xenon lamp to shine on the sample when measurements are made. The instrument then uses this reflectance and applies a calculation based on the illuminant selected to give us data that represents how the sample would look under that particular lighting condition. Since a change in illuminant is just a calculation in a spectrophotometer, after the sample is measured, color values for different illuminants can be determined with just a click of a button. It is important to understand, though, that color values obtained under one illuminant will be different than those obtained under a different illuminant, This is because the lighting does have an effect on how people see color. In the Paper Industry illuminant C and standard illuminant D65 are most commonly used. They will give similar, but different results. In general color applications standard illuminant D65 is most common. Last week during TAPPI CorrExpo in Louisville, KY, several standards committees met. 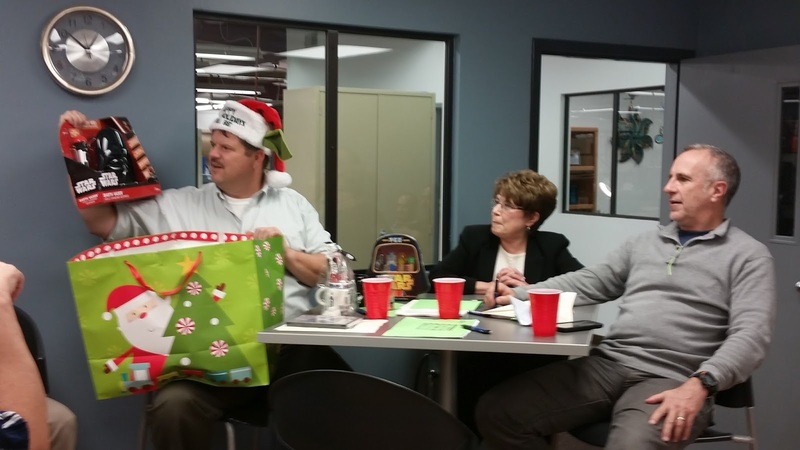 Each year these committees meet at least two times, once in the Spring and again in the Fall. All of these committees write, edit, review, update and withdraw test methods and standards that are used within the Pulp & Paper Industry. Supervises the program for Standards, TIPs, and Useful Methods and develops and maintains the guidelines for the development and review of these documents. All industry participants in these groups are volunteers. Great work to develop and maintain usable test methods and standards for the industry is done through these committees. At the 2012 International Paper Physics Conference in Stockholm, June 10-14, 2012, Jin-Ho Lee and Jong-Moon Park produced a study titled, "Evaluation of drying shrinkage velocity of paper to analyze bulk and stiffness changes of paper." The aim of this study is to find out appropriate ways to increase bulk and stiffness of paper. Maximum drying shrinkage velocity is newly developed to verify bulk and stiffness improvement mechanism by evaluating drying behavior and drying impact of wet-web according to varying papermaking parameters. Physical properties of paper including bulk and strength were highly correlated with the maximum drying shrinkage velocity because fibers and their interfaces are shrunk during drying despite of fibers bonding interfering conditions by fillers and polymers. Paper bulk could be increased with decreasing the maximum drying shrinkage velocity. The drying shrinkage of paper also could be controlled by fiber-to-fiber bonding interfaces by the bulking agent. In this case, paper strength including stiffness was decreased by reducing fiber-to-fibers bonding but it be improved by strengthening fiber-to-fiber interfaces with polymer complex without loss of bulk. This type of analysis can be performed by using the Emtec HSA - Heat Shrinkage Analyzer . It is a measuring instrument for the investigation of the dimension stability of paper/board/OPP foils under thermal load up to 230°C. What would you like to see from Technidyne? Technidyne has been introducing updated versions of many classic instruments in the last year. What would you like to see updated? Or, is there something you would like from Technidyne that has not been provided in the past? Technidyne started selling roll hardness measurement equipment a couple of years ago. The instrumentation provided much needed improvements over the Schmidt Hammer which was designed for concrete measurement, not paper hardness. However, our customers were asking for several additional improvements in this technology and measurement area. The ACA Systems RoQ (roll hardness profiler) provides many advancements. 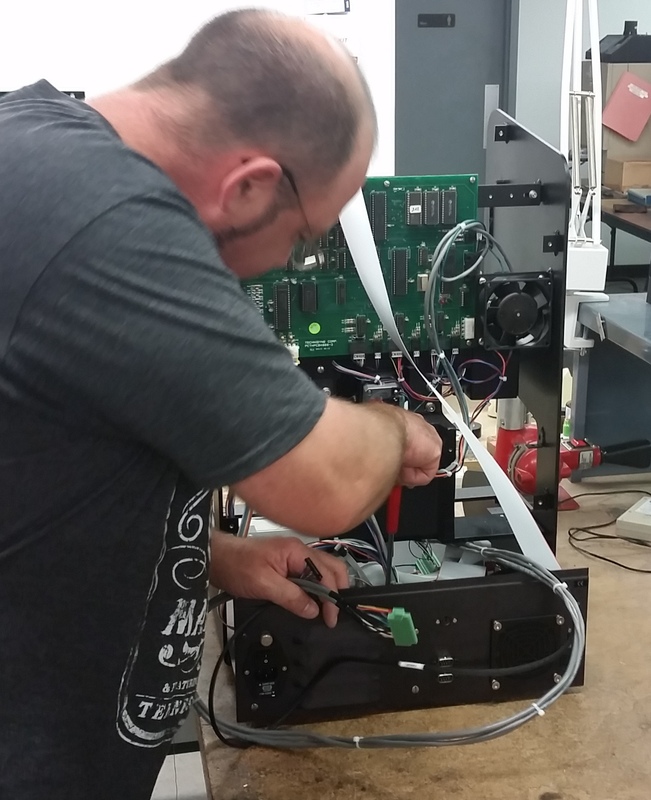 With over 50 roll hardness units already installed in North America by Technidyne, and with many of the new RoQ units on order, Technidyne customers are experiencing the cost savings associated with modern technology. The Cobb size test measures the amount of water a specified area of paper will absorb in a given length of time. Why can't the Cobb test give this kind of information? The Cobb test gives an average indication about the surface sizing plus internal sizing. No information about surface pore structure or/and surface sizing is possible. How is this important information about surface and internal properties attained? The Emtec PDA is capable of gathering this information. In a test cell, the PDA contacts a paper sample with liquid. 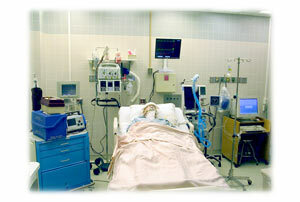 From the moment of contact, low-energy high-frequency ultrasound is transmitted through the sample in the z-direction. While the paper absorbs the liquid, the attenuation of the ultrasound undergoes characteristic changes. The ultrasonic signals are received by a high-sensitivity sensor for processing in the PDA.C 02 from where they are transmitted to a personal computer and displaced as an intensity vs. time diagram. All quality parameters of paper and especially those surface properties which influence the wetting and absorption of an appropriate test liquid. Quality parameters of liquids that may be characterized by means of a test paper. Converting behavior of industrial paper / paperboard grades and process fluids. Many companies have mandates as they move toward new product offerings, operating cost reductions and data requirements. Technidyne can help evaluate where you are today and what may be the most cost effective way to move forward. Technidyne instruments are robust and many instruments in the field are well over 20 years old. However, with the Color Touch™ X, TEST/Plus™, and PROFILE/Plus™, Technidyne offers many opportunities to update your instrumentation at a reasonable cost while enhancing your capabilities. Reductions in man power over the years has left many of our customers short handed. They do not have the people to keep up with maintenance and calibration. Technidyne's team of regional service personnel offers greater opportunities to assist on an annual, semi-annual, quarterly or even monthly basis. Service personnel are always close by, but scheduled service saves you money and time. Technidyne is known for its calibration standards offerings. Now with CalStandards.com, anyone can shop, purchase and receive standards on their time frame. New items are being added regularly to meet your calibration and routine service needs. As requirements and competition changes, the need for additional or new data arises. Technidyne's laboratory offers testing services of many kinds. From round robin testing to receiving data from new tests, there is a breadth of knowledge and data that can help one best decide how to tackle your daily challenges. Are brightness and tristimulus Z the same? Both brightness and tristimulus Z are optical measurement results from the blue part of the spectrum. 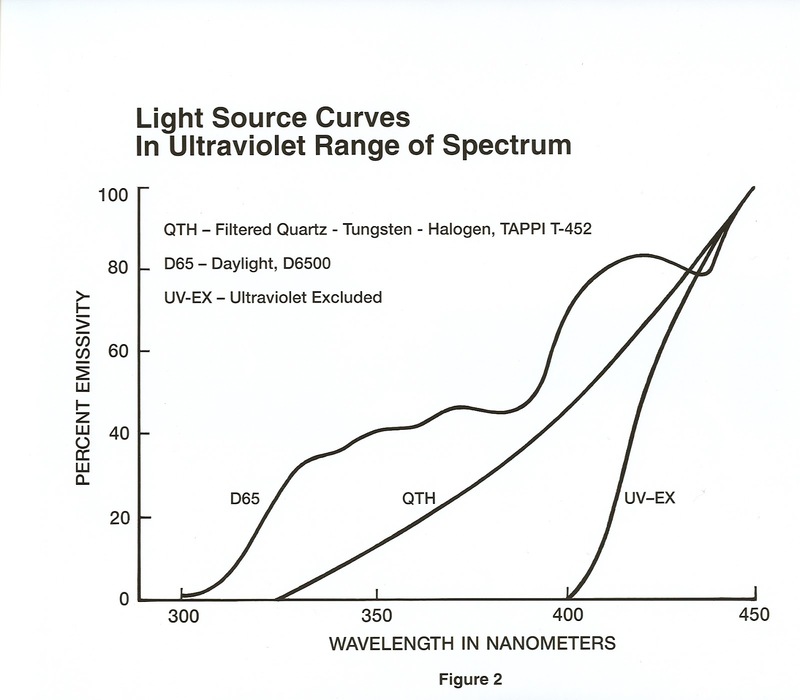 According to TAPPI T 452, the brightness function is defined with the effective wavelength - 457.0 +/- 0.5 nm obtained by the combination of illuminant, glass optics, filters and photodetector as seen in the graph below. It was defined in the 1930's to assist in measuring the bleaching process. The wavelength and function were built around a copper-sulfate filter which was used in the original GE Brightness instrument. According to CIE 15-2004, this comes from the 1931 standard observer experiment (2° cone angle) of the CIE which defines how the average person sees color. The Z value specifically relates to how the average person sees blue. It is centered around 445 nm. People over the years have used the tristimulus Z to estimate brightness. However, they are different functions and will result in different values. The Z value was used in the newsprint industry for some time and was later replaced with brightness measurement in the 1980's. Also, since measurements on the Zeiss Elrepho were complicated, many people used the Z value instead of brightness simply to save time. If the spectral curve of a sample is flat in the blue region the values of the two different measurements will be similar if not the same. However, if the sample has a lot of character (up slope or down slope) in the blue region, the brightness and tristimulus Z values can be very different. Since Dr. John Parker introduced the Parker Print-Surf (PPS) instrument in the early 1970's, strategies have developed to improve the repeatability (measurement to measurement agreement) and reproducibility (instrument to instrument agreement). Even though there have been many iterations and generations of the original PPS instrument, Technidyne developed a brand new instrument in 2001 that resolved many, if not all of these issues.